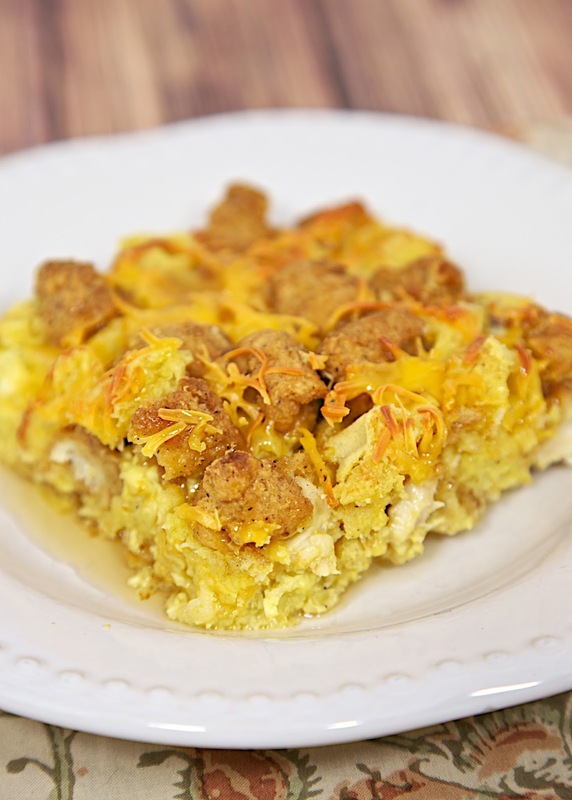 Chicken & Waffles Casserole Recipe - chicken and waffles baked in a maple egg custard - sweet & savory in every bite. Can make the night before and refrigerate until ready to bake. Chicken and Waffles are a thing. I didn't realize this until a few years ago when I saw Bobby Flay do a Throwdown episode about Chicken and Waffles. I was definitely intrigued! My favorite version of this sweet and savory dish is at Bouchon Bistro in Las Vegas. SO good. Bouchon is in the Venetian Hotel and Casino. Check it out if you are in Vegas! Chicken Legs loves breakfast casseroles, so I decided to make a Chicken and Waffles Casserole. 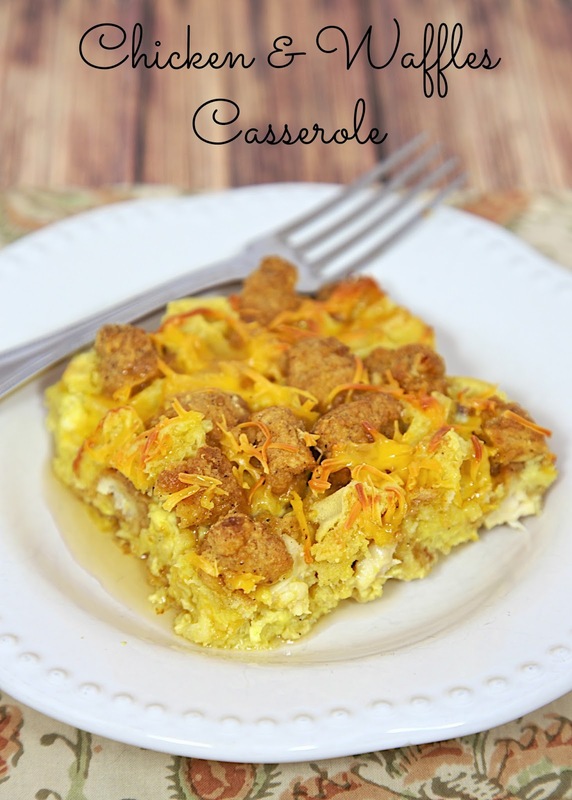 I adapted one of our favorite breakfast casseroles (Maple Sausage and Waffle Casserole) for this recipe. I swapped the sausage for some frozen popcorn chicken and left everything else pretty much the same. This casserole needs to sit in the fridge for a few hours. I usually just make it the night before we eat it. We topped the casserole with a little extra maple syrup. Hot sauce would also be good! Slightly thaw the popcorn chicken and chop into bite-sized pieces. Grease an 8-inch square baking dish. Add half of the cubed waffles in a single layer. Top with half of the chicken and 1/2 cup of the cheese. Layer the remaining waffles and chicken and 1/2 cup more cheese. Whisk together the eggs, milk, maple syrup, salt, and pepper in a medium bowl until combined. Pour the egg mixture evenly over the casserole. Wrap the baking dish with plastic wrap and place refrigerate for at least 1 hour, or up to 1 day. Bake at 325ºF for 45 to 50 minutes. Holy cow this looks amazing! I'm going to take this to some friends who just recently had a baby! Thanks for posting!